Over the last couple of years, my taste in jewellery has really changed. I used to like big and bold, statement jewellery but I found myself preferring smaller, less heavily detailed pieces in recent years. I was wearing my Thomas Sabo bracelet most of the time with just a simple pair of studs in my ears and found that my two drawers full of jewellery weren’t getting a look in. For years, I’d hoarded jewellery and bought tonnes of it, thinking that I was building up this fantastic collection with a huge wardrobe of jewellery to choose from. I’d go into Primark or New Look, especially when they had a sale on, and I’d spend so much money buying ALL of the jewellery pieces that I liked because they were ONLY £1 and such an amazing deal to be able to get them on sale. Little did I know that years later I would suddenly come to the most obvious realisation; all of those £s add up. And when you’ve bought as much as I have, the total is a hell of a lot. It’s a disgrace really when I look at it. Unbelievably, I’m actually a person that likes and intends to be relatively organised so when I bought my bedroom furniture I also purchased some plastic cartons, the kind that Chinese takeaway comes in. I got all of my jewellery out, sorted through it and then organised all of my pieces into each tub by colour; light pink, bright and neon pink, coral, deep pink, red, turquoise, yellow gold, champagne gold, the list goes on and on. I had 16 tubs in these two drawers and they were FILLED to the brim. I had that much stuff that I couldn’t keep on top of it, let alone wear it and by the time I finally decided enough was enough, it was all a big mess. As a blogger, I thought I’d been doing the right thing by keeping it all so that I had plenty of different pieces to choose from but in reality, I never wore the majority of it and my tastes and fashion had changed. My longer lasting jewellery and real gold/silver was growing slowly and I was getting so much more use and enjoyment from it that I knew deep down that I had to sort this costume jewellery mess out. So one evening, around about this time last year, I mustered some late night energy and started to get the drawers out. I did one drawer and then the other and took it in turns, tipping the contents of each tub out, organising it into piles (I used the following categories; stud earrings, dangly earrings, bracelets, bangles, statement necklaces, dainty necklaces and rings) and then I moved on to deciding what to keep and what to get rid of. Is this item complete? Check for missing stones, broken gems, lose thread, tarnishing and single earrings. If no then CHUCK, if yes then move onto step 2. Have I worn this item in the last year AND will I wear it again in the next year? This seems like a broad consideration to make but I like to look at what I wear in terms of the time of year that I wore it because if I’m clearing out my jewellery in winter then I’ll tend to feel differently about my pastel jewellery than I would do if I were looking at it in spring. So if I’m looking at bright pieces like that hideous neon choker then I’ll ask myself, ‘did I wear this last summer?’ and ‘do I think the chances are high that I’ll wear it again next summer?’ Costume jewellery is usually trend led, aside from classic pieces like a string of imitation pearls etc, so this should be an easy one to judge. If you answered yes to both parts then move onto step 3. If you answer no to either part then move onto step 4; I say that because unless its a brand new piece, if you bought it a year ago and haven’t touched it since then STOP kidding yourself, you’ll be in the same position next year. Trust me. Is this a piece that I actually enjoy looking at and wearing? Ultimately, it doesn’t matter how many times you’ve worn it in the last year or how often you envisage wearing it in the next, if it doesn’t make you happy when you see it or wear it then there is absolutely no point in keeping it. Life is too short to be surrounded by things that you don’t love and I’ve really started to live this philosophy in the last 18 months and even more so since the beginning of this year when I read Marie Kondo’s book. Organise it, or give it a better home! If you answered yes to step 3 then that’s the point at which you’ve decided to keep the item and you can go ahead and organise it in whichever way you like. In fact, I’m going to do a post on my set up soon to share the way that I organise my jewellery. However if you answered no to the above then you’re onto the stage where you re-home your unwanted jewellery. Sell or auction– I find that individual pieces of used costume jewellery are really hard to sell on sites like Ebay and Depop, unless they’re a designer item. You could give them a try or group some complimentry pieces together and list them as a bundle. An alternative to these big websites would be to find a Facebook selling group in your area on Facebook. There are tonnes of them that are all made up of members of the local community, and people will buy almost ANYTHING on them. This works best if you really just want to get rid of the items for a small amount of money that you can put towards something else such as your smaller bills for the month, your food shop or a trip to the pictures. Don’t be expecting mega bucks, depending on what you have to sell, but you’ll be helping out someone else in your community who may have been looking for something just like that particular item or who may only have the funds to buy second hand. Another option would be to collect your unwanted jewellery along with anything else you don’t want to keep in your home and do a jumble sale. I did one earlier in the year and raise £300! Gift– The next option is to gift the item to someone else. You’ll need to really check out the condition of the item but if its in usable condition and you know someone who’d like it, then consider asking if they’d like it. When I cleared out my jewellery, I had lots of pieces that I knew my friend would like so when she next came round, I gave her a bag to go through and pick out what she wanted. There was plenty of pieces that she wanted for herself as well as a few bits for her daughter to play dress up with. The rest of the items, I donated. Donate– If you don’t need or want to sell the items or give them to a friend then please don’t chuck them way if there’s life left in them. Donate to any number of the hardworking charity shops around so that they can sell them on to gain more money to benefit the charity. Choose one thats close to your heart; I tend to pick cancer charities. Once you’ve got rid of the excess and organised everything, give yourself time to see if the pieces that you’ve kept are definitely what you want and reduce your stash further if needs be. I’d recommend not buying anything new for many months, unless you need a specific item to wear that night etc, so that you can really use and enjoy what you have now. If anything breaks, becomes tarnished or is no longer making you feel happy when you’re wearing it then follow the steps above. This is so crucial to keeping on top of your jewellery collection and making sure that you’re using and enjoying all of the things that you own. I found that by October this year, I was starting to become bored of the jewellery that I had. After my first cull, I’d reduced my stash down from two drawers to one with 8 tubs instead of 16 but as fashions, and my tastes in particular, had changed, I found that I wasn’t wearing quite a few of the pieces that I had in my collection and I really needed to repeat the process above, then update my collection. I bought a few bangles from StudioB, before heading to River Island for some on trend, fast fashion pieces. If you’re looking for costume jewellery then this is the place to go to as it has lots of the latest styles in different colours and the prices aren’t too over the top for what they are. River Island jewellery doesn’t last forever but if you choose wisely by buying trend led pieces such as this River Island Black Wrap Bow Choker, then you’ll be able to save more money that you could put towards more classic pieces that you’ll definitely be able to wear for years to come. You’ll be getting a good quality item that will last you a good few seasons while the trend is around but if it becomes damaged after then, its not so much of a hardship than if you’d spent ten times the price on it! This bow choker is absolutely gorgeous, great quality as it holds its shape and it is the exact trend that I was looking for. I bought it from the plus size section and its VERY generously sized; I definitely could have ordered the standard size. At the beginning of October, my hubby surprised me with a Pandora Rose Hearts of Pandora necklace which sits quite high on my chest. Its an absolutely beautiful piece that would be ideal for day or night wear for years to come. I picked out the River Island Rose gold chain choker (similar) necklace to wear with it if I’d like to switch up the look. The necklace sits high up on my chest while the choker sits higher on my neck for an edgier, layered look. The two together are especially beautiful. There was definitely a gap in my current jewellery collection for a statement necklace that could transform an number of outfits but I didn’t want something too heavy, big or bulky. The rose gold statement choker fit the bill perfectly. It has the most beautiful sparkle to it but its not too in your face and it goes with so many different outfits. They have it in a couple of different colour ways too; a pearl and gemstone version and a black version. I didn’t have any rose gold bracelets, aside from one very fine one, that I could pair up with other items. When I spotted the rose gold tone bracelet, I snapped it up because it’ll be great for layering with some of my silver bracelets that are of a similar style. It isn’t very lose on my so if you do have larger wrists, I’d suggest giving this one a miss. Years ago now, I bought a silver and a gold pair of diamante hoops just like these from Mikey at House of Fraser. I wore them to death and when I was looking at my current jewellery pieces most recently, I saw that the silver one had tarnished and the gold had some stones missing. It was time to update! I saw the rose gold jewel encrusted hoops on the River Island website and thought that they were just what I was looking for; they’re not too big, the shade of the rose gold is beautiful and the crystals add a gorgeous hint of sparkle. The last piece of jewellery that I updated my collection with were the River Island Silver Tone Crystal Stud Earrings. I’d seen this style worn on Katie Price YEARS ago and I always wanted a pair as I loved how elegant and sparkly they are. These highstreet dupes were the most fabulous find as they embody this classic style perfectly yet they’re a tiny fraction of the price that real diamonds would cost. Plus, I don’t have to be too frightened about losing these ones! Although I’ve referred to it as a jewellery collection update, I’m really trying to think of my stash as a jewellery selection as collection implies to me that I need to keep on collecting and amassing far more items than I actually need. Since clearing out my jewellery collection, I now have a selection of really gorgeous pieces that I wear so frequently. They mix and match well with my existing jewellery and I’m happy with how every single pieces looks when I wear them. I’m no longer going on mad sprees, buying 7 pairs of earrings at a time just because they’re all on sale and I like them all; I’ve really tried to hone my skills so that I’m able to decide which one I actually want rather than buying everything that I see! I also buy what I need rather than want. If I saw another black choker that I liked at the moment, I wouldn’t buy it because I’ve got more than enough already and only 1 neck to wear them on! 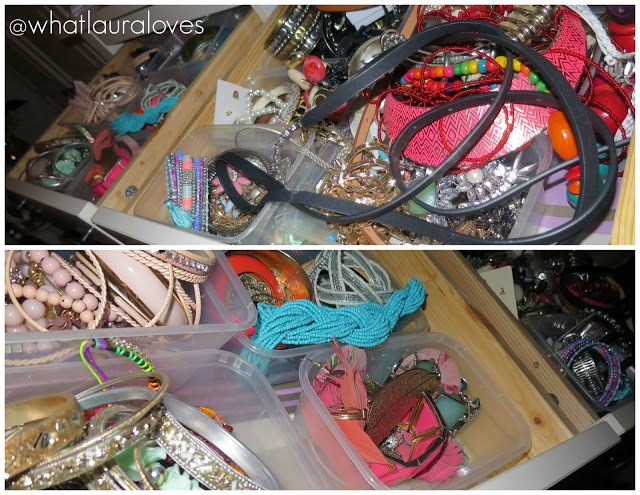 I feel so much better for it and if you’re a jewellery hoarder like myself, then I’d urge you to do the same! When was the last time you cleared out your jewellery collection? How do you decide what to keep and what to get rid of? What new jewellery pieces have you added to your selection recently? Wow you have so much jewellery so I think it is great that your collection is now more minimalist. I love the bangles! Fab post! 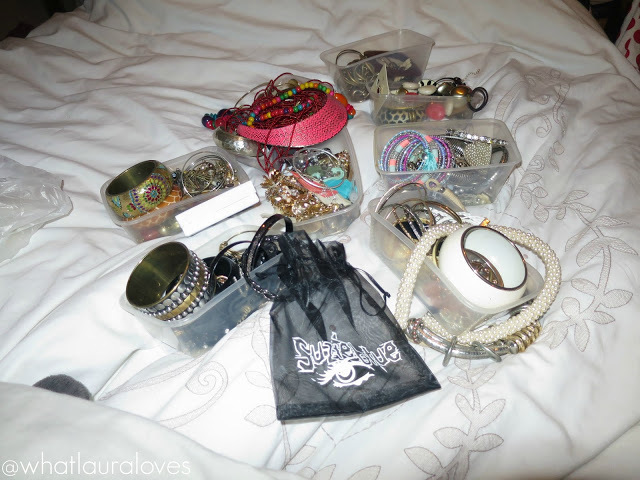 I just cleared out my jewellery when I did my room out last week. I had a stunning new necklace and earrings set from my friend for Christmas and it's Winnie The Pooh since we both love Disney. It's so precious! But one piece I will never rid is the locket my dad gave me last year before he passed away. He knew he didn't have long left and he wanted to give my siblings and I a precious gift. So my sister and I have matching lockets and my brother a watch. I'm quite good at clearing what I have and don't need. Luckily I can donate mine to the school fete if it's still in good order as they have a second hand jeweller stall. I have a jewellery clearout regularly; every few months or so. I've never had as many shiny things as you, but I keep on buying this junk that I then never wear…I've never really taken River Island for a good jewellery place, but clearly I'm mistaken; these are absolutely gorgeous! I don'thave much jewelery tbh – just my engagement ring and a couple of amber necklaces. These are such helpful tips lovely – I suffer from over cluttering! Big time! Such great tips. I have a huge jewellery collection but I'm too sentimental about it all and can't part with it! My jewellery collection is all over the place and definitely needs sorting out. Thanks for the tips. I always find myself hoarding jewelry when I really don't wear it! I need to start wearing some more then figure things out from there I think! Lovely pieces from Rier Island there! There's no clearing out of my Jewellery anymore. Anything cheap and cheerful gets passed on to my girls to play with and wear. My midrange stuff gets put away for when they're a bit older and my posh stuff, well that's for ever treasure. Funny how I have read this today. I literally looked at my overflowing jewellery box that no longer closes today and thought I should go through it soon! i'd love to here more about your experiences with the konmari method!